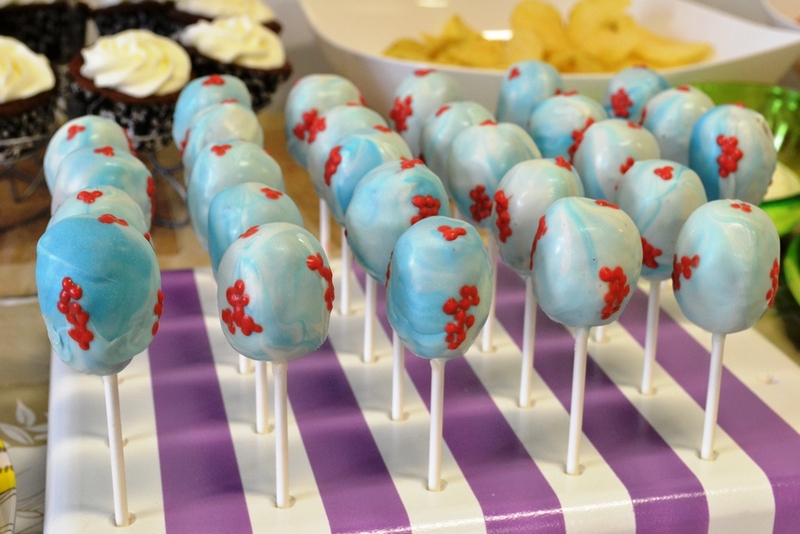 She asked for a raspberry cake and that the cake pops be marbled in blue and white with berries panted on them. 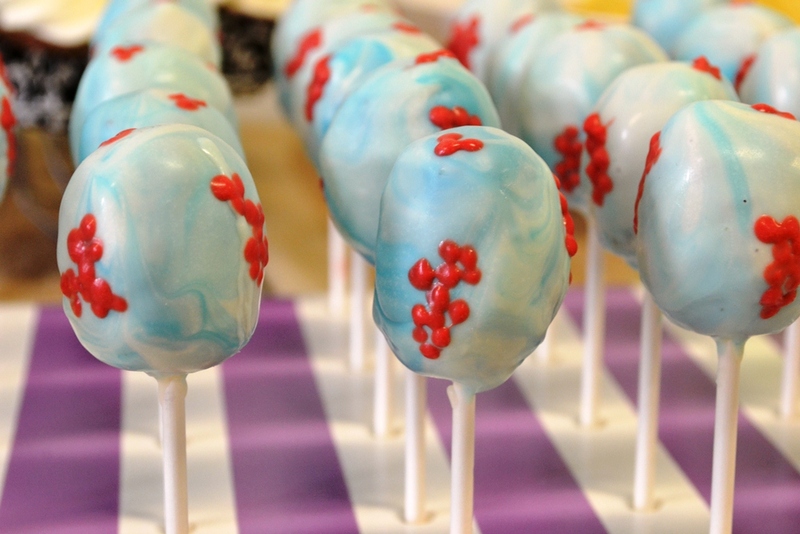 I never marbled cake pops before so I had to do a little research to find out how to do that. Thanks to PintSizedBaker I was able to figure out how to marble. But first things first, the raspberry cake had to be made. The recipe comes from a cupcake recipe actually. However, I was very sure that it would make a great cake. Mix the flour, baking powder, and salt and set aside. Mix sugar, egg and oil in a large bowl until well combined. Add the rose water, which is just for flavouring and can be left out. Alternating, mix in flour mixture and milk until all is well combined. 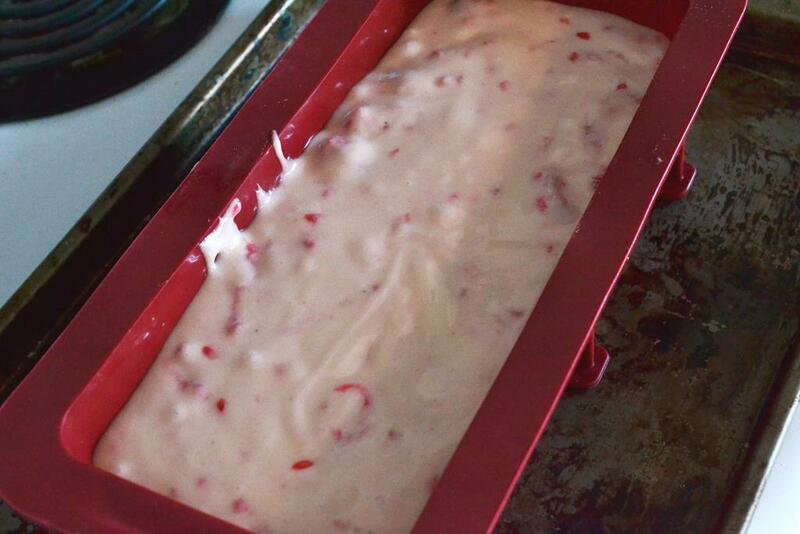 Wash raspberry, dry them off and add to the batter, mixing carefully. Tip 1: You should use a spatula to mix in the raspberries. Fill into a greased and flour dusted pan and bake at 180°C. I started with 30 min and added 10 min until it was done. Frankly, I don’t know how long it really took, maybe an hour. The cake is done when a skewer comes out clean, though it will be moist due to the raspberries. 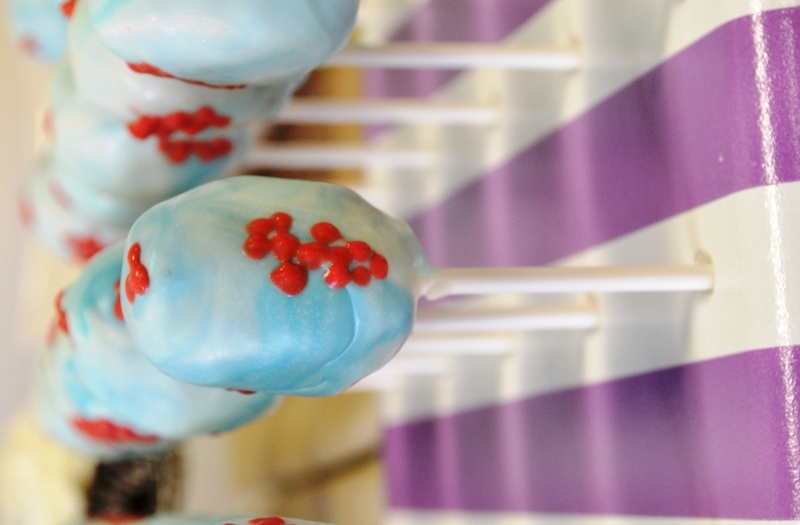 Let the cake cool off completely before you start with the cake pops. Crumble you cake either with your hands or a food processor. Add frosting until you have a workable consistency. Tip 2: The raspberry cake was very moist thanks to the fruit. I did not need any frosting to have a good consistency and form cake balls. Form cake balls, to me more accurate, use a scale so every cake ball is the same weight. Place into the freezer for 10 min. While you wait you can melt the chocolate/candy coating. Melt the light colour first and use it to dip the lollipop sticks. Dip lollipop sticks and insert into cake pop half way. Place the cake pops into the fridge to cool the chocolate. Melt the other colour(s) while you wait for about 5 to 10 min. 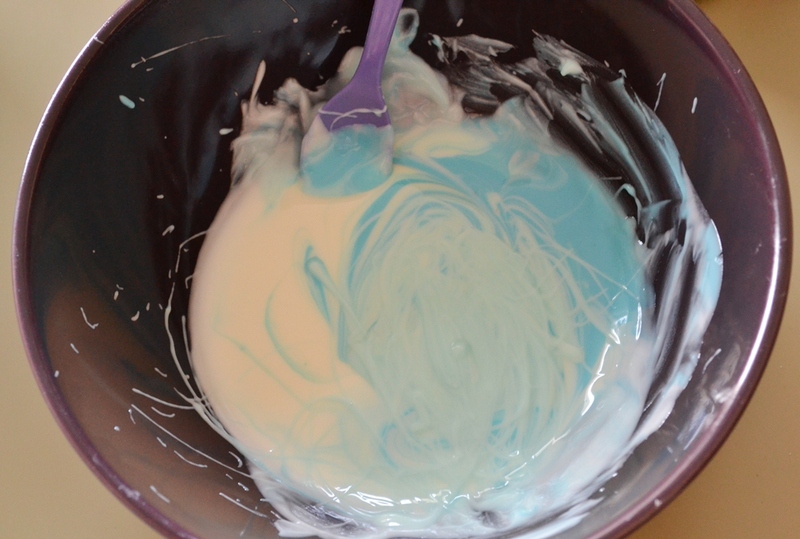 Pour two or more colours into a bowl but make sure they do not mix too much. Take a cake pop and swirl it through both colours and let the additional chocolate/candy coat run off. The first cake pop might not look perfect marbled but it will get better as you go. Use a little spoon to add chocolate/candy coating where needed. Place them in a cake pop stand or Styrofoam block to let the chocolate/candy coating set. 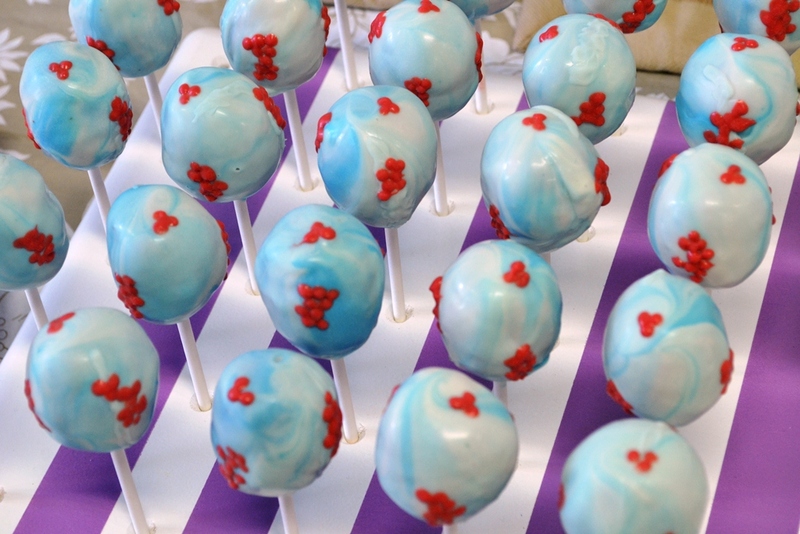 Tip 3: A cake pop stand is a stand made of wood or acrylic, which has holes drilled of the size of a lollipop stick. Mine is from KCbakes and has done me great service. She has different sizes and styles to choose from. Now the fine work begins. To draw on the berries, melt some red/blue/dark chocolate/candy coating. Use a fine brush to apply dotes in a berry formation. You can go a little crazy here if you like and choose the pattern as you go. All that is left now, pack them up into bags and add a lovely ribbon.